It sort of makes me mad that this is the only picture of Eotriceratops making the rounds on the web right now. It's a horrible picture, and clearly a sculpture rather than the actual fossil. I want to see the bones, dammit! But look at the size of that monster! E. xerinsularis was just published last week in the Canadian Journal of Earth Sciences, and its authors suggest that it belongs in a group including Triceratops, Torosaurus, and Diceratops. Eotriceratops is known from deposits significantly older than those ceratopsids, though. Its head is apparently the size of a European SmartCar, and is quite a bit larger than typical Triceratops skulls. 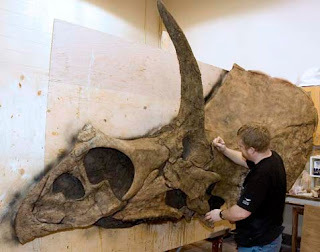 What shocks me about the skull is that, despite its ridiculous absolute size (which approaches the current record-holders, Pentaceratops and Torosaurus), the proportions of the skull are similar to those of Triceratops. It's as if Eotriceratops is a scaled-up Triceratops. Like every other well-known ceratopsid, Eotriceratops' diagnostic characters are in its head, and its unique bones include the premaxilla, nasal horn core, squamosal, and epijugal. Seeing as there are obvious similarities between Eotriceratops and Triceratops, one wonder what the former can tell us about that most problematic of ceratopsine taxons, Diceratops. That misnamed genus was named by Lull in 1905 on the basis of a basically complete, but poorly preserved, single skull. While originally named Diceratops, the animal eventually fell under the Triceratops moniker, ironically, by Lull in 1933. What made Diceratops distinct at all? It has small holes in its frill--features that are present in all other ceratopsians, but not in Triceratops. By the by, the lack of fenestrae in Triceratops' frill is generally considered an automorphy of that genus. 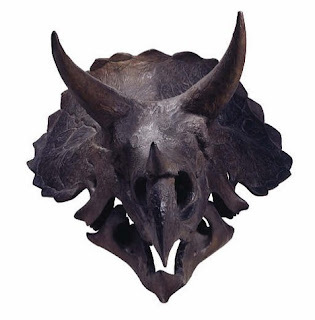 Although the frill's small, rounded construction brings to mind the centrosaurines, the rest of Triceratops' skull is clearly of ceratopsine affinities. Given its close relatives--Torosaurus, Arrhinoceratops, and Pentaceratops, the small, rounded frill of Triceratops is a bit of a puzzle. Yet even juveniles are fenestrae-less, so the Triceratops' frill is a very distinct feature. At any rate, Diceratops' frill has small holes behind the horn cores, and, oddly, one more just behind each postorbital fenestrae. Lull attributed these holes to either pathology or injury, suggesting that 'Diceratops' merely represented an old individual of Triceratops. Other more minor oddities of Diceratops include nearly vertically-oriented orbital horn cores, a rounded nasal horn core, and a proportionately shorter snout than most Triceratops specimens. Of course, Triceratops itself shows incredible individual diversity, as more than a dozen species were once recognized, all based on minor individual variations. That number has now been knocked down to just two species (and even these may be the result of sexual dimorphism): T. horridus and T. prorsus. Since Lull's 1933 suggestion, Diceratops' true relationships have continued to provide debate. It has been called a sister species to Triceratops, an ancestral species (or genus) of Triceratops, or an old/injured Triceratops. In his extremely informative summary of the Ceratopsia, The Horned Dinosaurs, Peter Dodson declined to say for sure whether Diceratops was a distinct taxon or not, but since that 1996 tome, I have continued to see Diceratops treated as a unique genus in ceratopsian literature, and I wonder if Eotriceratops will illuminate its taxonomic position at all. Many thanks to Jerry and Louis for sending me a copy of Eotriceratops' description. Now I'll be able to answser my own question (hopefully!). If any of you readers would like a copy, feel free to email me, and I can send it along. I'll see if I can track down my photos of the fossils as they were preparing it, but their not much to look at. The skull was found in a coal laiden layer, and thus the bones are pretty woren bone by acidity. Their more like a siloeutte in a sense as all their surface features were eroded. That I think is part of why the puncture marks on the eye are hard to decipher (again I think)... I don't know the details as I was just an intreperter (for 5 years mind you) at the Tyrrell while they were working on it, but I remember part of the big deal was that i was found amongst coal which doesn't normally happen in alberta. Which suggests a marshy environment, right? It's just really really odd to find a Dinosaur IN a coal seam. The sedimentation of most Alberta Cretaceous captures these flood plains in mudstones, sandstones, and coal. Naturally we tend to find most Dinos in fast moving water systems that lay down the sandstones, and their associcated big flood events (perfect for burying dead things). The horseshoe canyon foramtion which I have the most expereince prospecting in Alberta (granted I'm not a pro palaeontologist) you rarely find Dinosaurs in the slow moving mudstone systems. Which makes sense as it's harder to bury stuff if sediment is only building up slowly. However the coal seams are devoid of any fossils typically except petrified wood. This is due to the high acidity of the decaying plant material in the swamp. Eotriceratops' skull somehow survived this acid (granted again very damaged from what I saw of the specimen). I'd venture that's because ceratopsian skulls are so heavily built that it survived long enouhg for the swamp to get flooded and buried thus killing off the decomposition. I will NOTE: everything I've said is about a ceratopsian skull they were working on from about 2003 till 2005, but it MIGHT not have been the Eotriceratops. At that time the skull was just horseshoe canyon triceratops. So there is a slight chance I have this wrong. I haven't worked at the museum for a year, and I just assumed that the new ceratopsian was the same skull. I was a science educator at the time not a technican. It's odd though that the frill is missing. Alberta's two latest ceratopsian's have had this problem. Yeah, exactly how much of Albertaceratops is known? From the press pictures I've seen, they've got the postorbital horns, a little tiny bit of the proximal skull, and some snout. That's all I've seen, though. It's good to know that more is there, though. I hope somebody sends me the bugger's description one of these days! Can't help you on the description (at least at moment). They have about 60% of it (a guess on my part though). The current mount of it at the Tyrrell is ALL real fossil bones, and they haven't altered or sculpted any of them. The Albertoceratops' weird story is it had some sort of rot on the feet while the animal was ALIVE! Darren Tanke I think is writing a paper on it. He thinks it was some sort of fungus. So who knows a Dino with trench foot!